A box with a mass of 2.0 kg rests on one end of a seesaw. The seesaw is 6.0 m long, and we can assume it has negligible mass. Approximately what angular momentum will the box have if someone with a mass of 65 kg sits on the other end of the seesaw quickly, with a velocity of 1.2 m/s? (e), since none of the options are correct. See video for explanation. This is College Physics Answers with Shaun Dychko. We have a seesaw of length six meters having a fulcrum in the middle we assume. That means the box on one end is three meters from the axis of rotation and this person who is initially going at 1.2 meters per second and we'll assume that is perpendicular to this radius here. It's also going to have a distance of three meters from the axis of rotation. The person has a mass of 65 kilograms and the box has a mass of two kilograms and the question is what will the angular momentum of the box be after the person lands on the seesaw? So the angular momentum of the box is going to be the box's moment of inertia multiplied by its angular velocity, that omega prime, the prime denotes after the person lands on the seesaw. 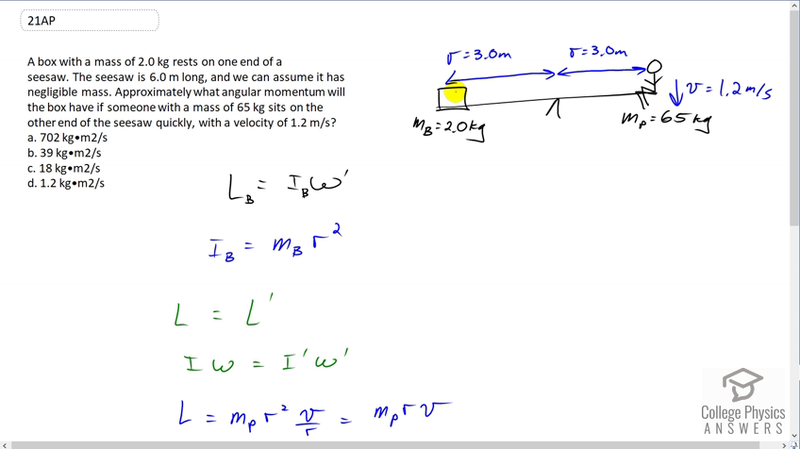 We're told that the seesaw has negligible mass which means we can ignore its moment of inertia which is nice, and so we're going to look at the moment of inertia of the box which will be modeled as a point mass. We have mass m b for box, multiplied by its distance from the fulcrum squared, and then we also need to figure out what the angular velocity will be and that's going to involve a bit more work. So, the total angular momentum of the system of box, person included, before the person lands on the seesaw equals the total angular momentum of the system after the person lands on the seesaw. So we can say that the total moment of inertia before multiplied by the angular velocity before, equals the moment of inertia after multiplied by the angular velocity of the system afterwards. Now before the person lands on the seesaw the moment of inertia of the system is going to just consist of the mass of the person multiplied by their distance from the fulcrum because just before they land on the seesaw, the system is just the person because that's the only thing that's moving and they're not connected to anything else. So the moment of inertia will just be that due to the person, and their angular velocity will be this tangential velocity, tangent to a circle you can imagine that's here, divided by the radius from the axis of rotation. Then one of the r's cancel and we're left with mass of the person times radius times their initial linear velocity. Then after they land on the seesaw everything is connected now and the moment of inertia is that due to the person plus that due to the box. The system will have some angular velocity now that we're going to calculate. We can factor out the r squared here and we have r squared omega prime times the total mass and now we have an expression for l prime and an expression for l and so we can equate the two. We do that here and so we have m p r v equals r squared omega prime times m b plus m p. Now the reason we're doing all this work is to figure out what omega prime is. So let's divide both sides by r squared times the sum of the masses. Then one of the r's cancel there and we're left with r to the power of one on the bottom and we have omega prime is mass of the person times their velocity divided by the radius times the total mass. So that is an expression we'll substitute in for omega prime here in our equation for angular momentum of the box and that's what I've written here. Then we also are substituting for the moment of inertia of the box and then one of the r's on the top cancels with one of the r's on the bottom and we're left with m b r m p v over m b plus m p. Then to write in some numbers, so we have two kilograms mass of the box, times the distance of three meters from the axis of rotation, times 65 kilograms mass of the person, times 1.2 meters per second, divided by two kilograms plus 65 kilograms. This gives when you plug it into the calculator, 6.98 which we'll call 7.0 kilograms meter squared per second. Now, the thing is none of these options even remotely resemble the answer. So, all we can do is make option E -- normally you can't do this in a test but this is the only option we can do. There we go!